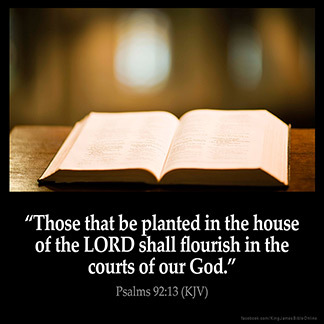 PSALMS 92:13 KJV "Those that be planted in the house of the LORD shall flourish in the courts of our God." 10But my horn shalt thou exalt like the horn of an unicorn: I shall be anointed with fresh oil. 11Mine eye also shall see my desire on mine enemies, and mine ears shall hear my desire of the wicked that rise up against me. 12The righteous shall flourish like the palm tree: he shall grow like a cedar in Lebanon. 13Those that be planted in the house of the LORD shall flourish in the courts of our God. 14They shall still bring forth fruit in old age; they shall be fat and flourishing; 15To shew that the LORD is upright: he is my rock, and there is no unrighteousness in him. Those that be planted in the house of the Lord, shall flourish in the courts of our God. They are planted in the house of Jehovah; They shall flourish in the courts of our God. Those who are planted in the house of the Lord will come up tall and strong in his gardens. Those that are planted in the house of the LORD shall flourish in the courts of our God. They are planted in Yahweh's house. They will flourish in our God's courts. Those planted in the house of Jehovah, In the courts of our God do flourish. (92:14) Planted in the house of the LORD, they shall flourish in the courts of our God. 92:13 Planted - Whom God by his gracious providence has fixed there. The house - In its courts; he means in the church of God, whereof all good men are living members. When I read the comment regarding everything that is in the garden eats from the garden I think of what God said to Adam and Eve. Gen. 3:9-16 still studying this concept out as it applies in a practical way in our walk with God. It's good to work with the work of God accoding to these verses.